We work around the state and the country, assisting schools and educators as they prepare learners for their future. But ESSDACK is more than just professional learning. Our Print Center generates thousands of pages of customized print jobs every month. Our amazing tech support folks are hands-on in school districts across Kansas – setting up networks, assisting with mobile device rollouts, and ensuring that district servers are up and running. We run poverty simulations. We lease copy machines. We provide access to affordable health insurance. And we are helping thousands of educators invest their money for comfortable retirements. So feel free to explore our services listed along the left. 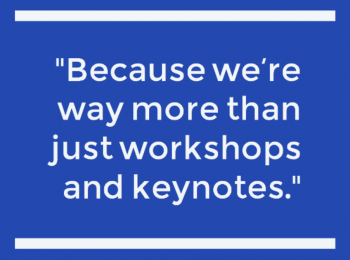 Because we’re way more than just workshops and keynotes. Not finding what you’re looking for? Have a question? Contact us via email or call 620-663-9566.